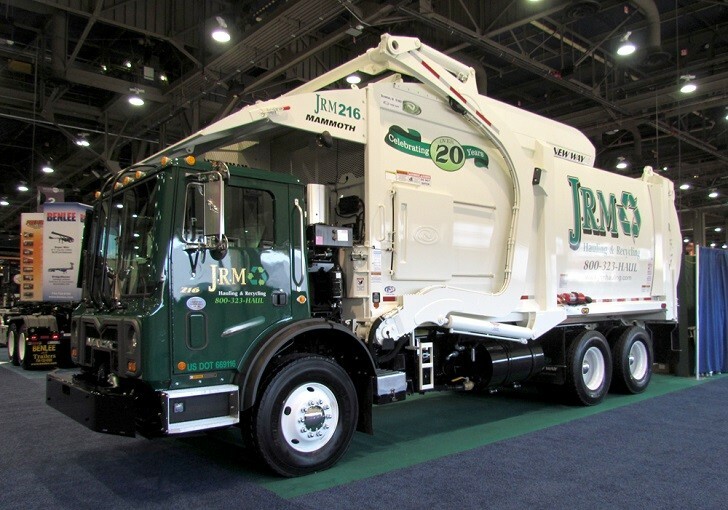 Introduced at the 2015 Waste Expo, held this past June, New Way's brand new Mammoth front loader includes a range of features designed for high productivity in refuse and recyclables collection. Designed with one-piece body side construction, a curved shell, for superior strength and streamlined appearance, the New Way Mammoth Front Loader comes equipped with the strongest steel specs in the industry, according to the Iowa-based manufacturer. In addition, heavy-duty, single-piece constructed arms, torque tube assembly and Pack-on-the-Go features maximize route and labour efficiency. Standard features on the Mammoth front loader include a 4-split bearing block with bronze bushings and an easy adjust deceleration valve; giving the operator control of the arm's return to the truck body. There are two safety cameras standard on this series; one affording the operator a view into the hopper and another for backing. This front loader also boasts the largest clean-out doors and sump in the industry. These two features combined have set the standard for ease of access and clean out of trash trapped behind the packing blade. As with all New Way Trucks, the Mammoth comes with a two-year cylinder warranty, standard. The Mammoth Front Loader is available in all standard sizes: 34yd, 37yd, 40yd (less options available) and 43yd. Units weigh approximately 15,550 pounds. New formed body and tailgate frames for added strength and weight reduction. Curved floor and roof for weight reduction. Redesigned arm cylinder geometry to reduce forces on bulkhead and centre deck. Larger hopper opening as standard. 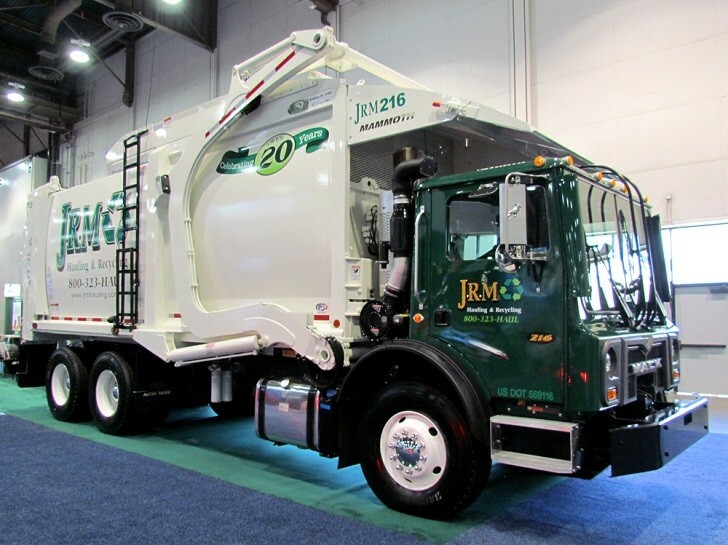 Optional CNG system mounted on the tailgate reduces over-all height of body with CNG chassis. Units shift weight from front axle to rear axle for improved weight distribution. New pack panel formed face plates allow for added capacity and greater packing force due to redesigned pack cylinder geometry. On board diagnostics via display screen. All electric main operating valve. Fork hoses routed through the arms.